It’s a remarkable photograph: A pregnant Orang-utan protectively clutching her five-year-old child as death seems imminent at the hands of bounty hunters armed with knives. At The Habitat Advocate we wish to emphasise and thank the vital role of wildlife photographers around the world whose photos continue to help convey the plight of wildlife at the hands of humans. Without such photos, the truth would be less disseminated. The following article was reproduced in The Sun-Herald newspaper (Sydney) on 20120129 on page 30. The article was borrowed from the New York Daily News newspaper (New York) which published the article on 20120127. The original source was the Daily MAIL (UK), written by Richard Shears, 20120127, under the long heading: ‘Don’t hurt my baby! 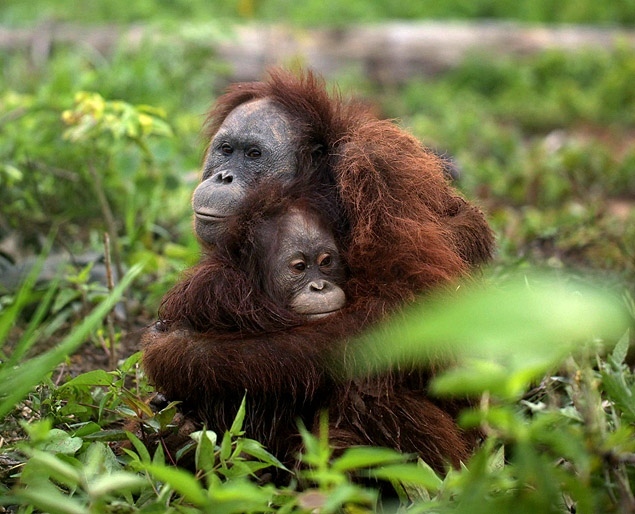 Pregnant Orang-utan protectively hugs her daughter as ruthless Borneo bounty hunters move in for the kill‘. The ultimate source is from the website of Four Paws UK. Four Paws International is an international animal charity, campaigning to end animal suffering and cruelty. Four Paws International was founded in 1988 in Austria to campaign against fur farms and against battery farmed eggs. The partner organisation based in Indonesia is PT Restorasi Habitat Orang-utan Indonesia (RHOI), which translates into English as the Borneo Orang-utan Survival (BOS). Its name could not be more literal! 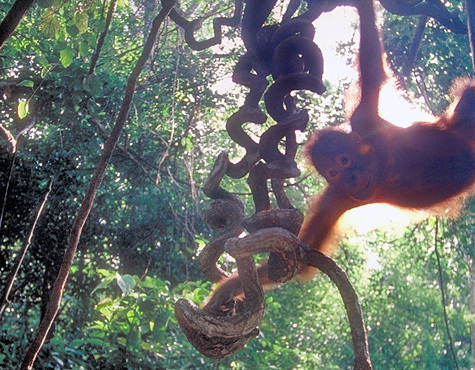 Humans are systematically exterminating a species – the Orang-utan. BOS has developed an Ecosystem Restoration Concession with the intention of using the forest area as a release site for rehabilitated Orang-utans. The proposed concession is in East Kalimantan is comprised of the ex-PT Mugitriman International (MGI) timber concession. BOS would like to obtain sustainable funding for managing and safeguarding this forest and is currently exploring the option of an avoided deforestation/REDD project where the sale of carbon. At the last minute, however, members of Four Paws International, an international animal-rescue group, swooped in last week and prevented their killings in Borneo, the Daily Mail reported. The incident showcases the threat Orang-utans are facing as they are targeted for slaughter with a price on their heads. The incident, compellingly captured in a dramatic photo of the mother cradling her child for dear life, casts a fresh light on the disturbing plight of Orang-utans, who were once common throughout Southeast Asia but now mostly live in Borneo and other areas in Indonesia. 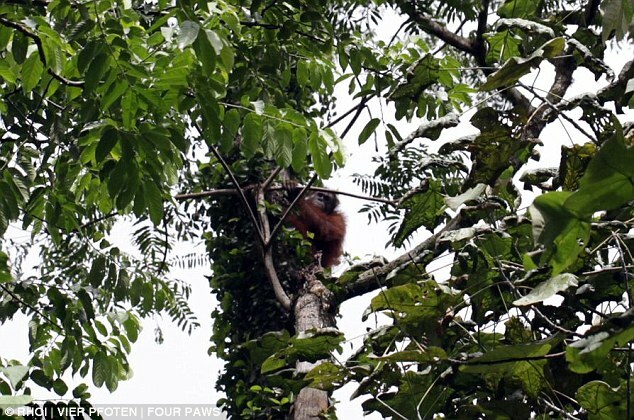 The mother, estimated to be between 25 and 30, and the child were the only Orang-utans the team found alive in the area surrounding a palm-oil plantation. The group said it was scouting the area after reports of mass Orang-utan slaughter. The spread of palm oil plantations, the group said, is accelerating the demise of the already endangered animals, which are losing native habitat because of widespread deforestation. The very name Orang-utan means “person of the forest,” as they spend most of their time in trees. The palm-oil companies, the group said, are allegedly making matters worse by offering rewards of about $100 per dead Orang-utan, because they see the animals as nuisances. “These massacres must not be allowed to continue,” Preuschoft said to the Daily Mail. The rescued animals have since been released back in the wild in an area far from where they almost met death. The mother was fitted with a radio transmitter to help ensure the apes stay safe, the group said. “Tens of thousands of adult Orang-utans have been slaughtered, while their orphaned offspring is frequently being sold off as pets or left behind to die, if they aren’t killed on the spot as well“, Four Paws International posted on its website. The slaughter of Orang-utans is illegal in Indonesia, but enforcement has stepped up only recently, the group said. “Mass graves that were discovered last September triggered the first few serious arrests, including a senior plantation manager“, the group wrote. [Source: ”Don’t hurt my baby! Pregnant Orang-utan protectively hugs her daughter as ruthless Borneo bounty hunters move in for the kill’, by Richard Shears, 20120127, Daily Mail (UK), ^http://www.dailymail.co.uk/news/article-2092722/Pregnant-orang-utan-hugs-daughter-bounty-hunters-Borneo-in.html] . As bounty hunters with bush knives entrapped them in a circle and moved in for the kill, the only thing this mother Orang-utan could think to do was to wrap a giant protective arm around her daughter. The pair seemed to be facing a certain death as a gang of hunters surrounded them in Borneo, keen to cash in on the palm oil plantations’ bid to be rid of the animals. But, happily, a team from the British-based international animal rescue group Four Paws International arrived in time to stop the slaughter and saved their lives. The pregnant mother and daughter were captured and moved to a remote and safe area of the rainforest and released back into the wild – but not before the mother was equipped with a radio device so she and her young can be tracked to ensure they remain safe. ‘We discovered a gang of young men surrounding them and both victims were clearly petrified. Mother and daughter were captured and moved to a remote and safe area of the rainforest and released back into the wild – but not before the mother was equipped with a radio device so she and her young can be tracked to ensure they remain safe. Mother and baby rescued and placed into the wild. 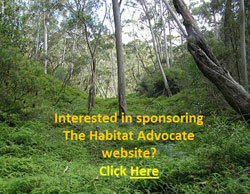 But with their rainforest wilderness rapidly being destroyed how long have these Orang-utans got? What happened to the father? Before the rescue, a Four Paws International team had scoured the area on the Indonesian side of Borneo, which is shared with Malaysia, but found no other Orangutans which had survived an earlier slaughter. Deforestation has dramatically reduced their habitat and their numbers have dropped from 250,000 a few decades ago to only 50,000 in the wild. And while the loss of their habitat by logging companies has created a major threat to their existence, a more brutal form of reducing their numbers has emerged in recent years – direct slaughter. Palm oil is used in hundreds of products from chocolate to oven chips, but the demand for buying it at a low price has resulted in significant deforestation as habitats are being destroyed to make way for plantations. Some palm oil companies see Orang-utans as pests, a threat to their lucrative business, and have placed a bounty on their heads. Company executives are reported to be offering up to £70 to employees for each Orang-utan killed on the palm oil plantations. While such stories were at first denied, proof of the slaughter emerged last September when graves and bones were found by investigators. 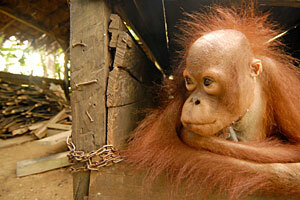 ‘Killing of Orang-utans is illegal in Indonesia but the law is lacking enforcement,’ said a Four Paws UK spokesman. In an equally tragic scenario, babies left alive after adult Orang-utans have been slaughtered have been put up for sale in the Pet Trade by hunters. When traumatised babies are found by Four Paws International and other animal rescue teams they are taken to a sanctuary and taught skills they will need in order to return to the wild. ~ Lo, cheshire, UK, 20120128. One of the most powerful opponents of our ‘Save our Borneo’ activists is Wilmar International, the largest palm oil company worldwide, based in Singapore. 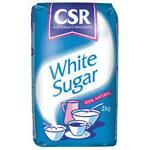 “Wilmar International Limited, founded in 1991, is Asia’s leading agribusiness group. The leading importer of edible oils into East Africa and one of the largest importers of edible oils into South-east Africa. ‘Sucrogen, the Australian-based sugar subsidiary of Singapore-listed Wilmar International Limited, looks forward to an exciting future as the new owner of Proserpine Sugar Mill after a majority of Proserpine creditors, by number and value, voted today to approve Sucrogen’s purchase of the mill. Sucrogen CEO Ian Glasson said the creditors’ vote was a great outcome and paved the way for the sale transaction to be completed immediately. Sucrogen’s offer comprised a headline price of A$120 million, plus a working capital adjustment, normal settlement adjustments, as well as absorption of the mill’s normal operating costs and certain critical capital expenditure incurred from 31 October 2011. Mr Glasson said while Sucrogen was pleased to finally purchase the mill, it was disappointing the sale was not possible before the Co-operative was placed into voluntary administration. Mr Glasson said Wilmar had expressed a strong interest in working with growers to help expand Proserpine’s sugar industry. 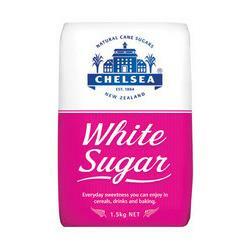 So the company that is behind the palm plantation clearing destroying Orang-utan habitat and encouraging Oran-gutans to be slaughtered, is the parent company that sells CSR Sugar across Australia and Chelsea Sugar across New Zealand and the artificial sweetener ‘Equal‘. Nordin, head and founder of our partner organisation ‘Save our Borneo’ (SOB) has lately experienced a great deal of suffering caused by the destruction of tropical rainforest in his home province Central Kalimantan in Borneo – including his own family. His little son Mirza was born when wildfires were raging for several months, obscuring the sky over Central Kalimantan and making breathing truly agonizing. Due to his chronic breathing difficulties, Mirza had to be hospitalised often. Even though slash and burn clearing methods are prohibited in Indonesia, fires are started again and again in order to gain more space for palm oil plantations. One of the most powerful opponents of our ‘Save our Borneo’ activists is Wilmar International, the largest palm oil company worldwide. (Wilmar International) act as if no rules apply to them. This company has the rainforest illegally logged and new plantations set up; they drive peasants off their land and arrest them if they defend themselves. Wilmar keeps founding new subsidiaries, and bribes officials to side-step the law. Therefore, Save Our Borneo’s boss Nordin sent ‘Rainforest Rescue’ a strategic plan in order to unite our efforts and take action against Wilmar: We are also supported by regional environmentalists of ‘Walhi’, the Indonesian branch of ‘Friends of the Earth’. Workshops with affected peasant families to discuss land rights and, possibly, draw up maps. Another goal is to inform the population about Wilmar’s modus operandi and how to defend themselves. Research and data gathering regarding activities of Wilmar subsidiaries. Public dialogues between all the parties involved, having politicians, scientists, journalists, environmentalists and victims of the palm oil industry all sit together at one table. Nordin calls his major offensive against Wilmar International an “Action Plan for a Better Life“. This entry was posted on Wednesday, February 1st, 2012	and is filed under Kalimantan (ID), Orang-utans, Threats from Farming, Threats from Poaching and Poisoning.